In the Art of War, Sun Tzu emphasized the importance of positioning in military strategy, and that the decision to position an army must be based on both objective conditions in the physical environment and the subjective beliefs of other, competitive actors in that environment. On the surface that might not seem to have anything to do with running. And, until last Friday afternoon I would have agreed with you. Sure, I understand that, to a certain extent, positioning in a general sense is important in road racing. If you want to run with the front pack you need to be IN the front pack. But I never thought about both the objective and subjective elements that Sun Tzu was talking about. What changed? Last Friday, at the Legends Panel of the Dodge Rock ‘n’ Roll Marathon and Half Marathon, Meb Keflezighi, Rod Dixon, and Jim Ryrun were discussing their running and racing careers. To hear them tell it, the outcomes of road races and track races were very often determined as much by the winning strategy as by the winning talent. It got REALLY interesting when I asked Meb and Rod, both winners of the New York City Marathon, how each of them, in their prime, would have beat the other. There was a little bit of good-natured chat, but when I pressed them their eyes narrowed and the warrior in both of them surfaced. 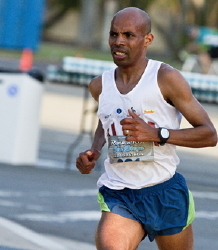 Meb, Olympic silver medalist in the marathon, is probably best known for his skill at distances of 10K and beyond. Rod, the Olympic bronze medalist at 1,500 meters is widely regarded as the most comprehensive runner of all time having been world-class at every distance from 800 meters to the marathon. No one before or since has enjoyed the scope of success that Rod did. This conversation, though, was about the marathon. Rod went first, explaining in great detail how he would insist that Meb run Rod’s race. He said he would set out to control Meb’s every move from the very start. He said he’d move around the road, surge and relax, and do everything he could to make Meb run the way he, Rod, wanted him to run. He said that if he could get inside of Meb’s head he could beat him. Most importantly, as an Olympic medalist in the 1,500, he knew that if they were together and mile 25 he could win. Meb didn’t waste any time responding. No way Rod would get inside his head. Meb starts with a plan and stays with the plan. He isn’t influenced by what’s going on around him. Finally, with more that a little sparkle in his eye he said that if they were together at mile 20 that he, Meb, being a 10K guy, would put his head down and punish Rod. At the end they were smiling, but you knew that BOTH thought they could have won. Both believed that they had what it takes to beat the other. 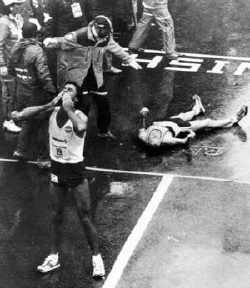 And that’s what made the both champions, not just of the New York City Marathon, but of life. It would have been one hell of a race. 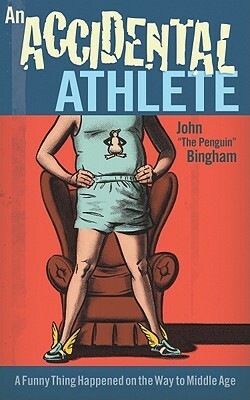 Order your EARLY copy of John’s NEW book An Accidental Athlete today. John, you wrote that so well it felt like I was sitting across the table listening. Fascinating! (And I’m not trying to sound like Mr. Spock.) Being a solid “back of the pack” runner, I never think about winning and thus it’s very interesting to hear their strategies. It never occurred to me that such things existed. I figured you run and if you’re naturally faster or better-trained and lucky, you win. Very cool.